Sutshekhar Ras (also spelled as Sootshekhar Rasa) is an important medicine used in ayurveda, which acts on PITTA DOSHA and reduces symptoms like heartburn, nausea, vomiting, abdominal pain, epigastric tenderness, hiccup, fever, breathing troubles, headache etc. It has wide range of indications, which will be discussed further in this article. First Shuddha Parad and Shuddha Gandhak are mixed and ground well. Then all other herbs and Bhasma ingredients are mixed and ground for 21 days with the Bhringraj Juice. After 21 days, sutshekhar ras tablets are made. Sutshekhar Ras is effective in all conditions in which these symptoms appear. It reduces TIKSHNA (Sharp or Penetrating power) and AMAL (Sourness) qualities of Pitta Dosha. Secondly, it also acts on VATA DOSHA and helps in all diseases occurring due to aggravation of Vata and Pitta together. Sutshekhar Ras is helpful in following health conditions. All organs of abdomen – stomach, liver, small intestine, large intestine, colon, pancreas, spleen, and gall bladder. Here we will discuss benefits and medicinal uses of Sutshekhar Ras in detail for a few health conditions. 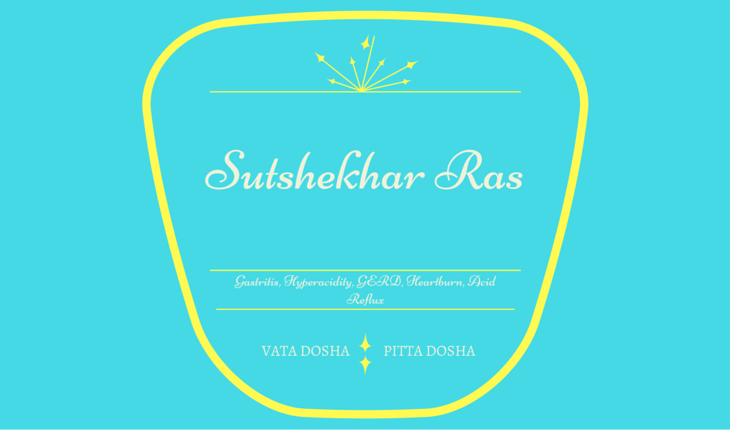 Sutshekhar Ras reduces the increased sourness and sharpness or penetrating powder of Pitta. These things are responsible for increasing acid production in the stomach and increasing the sensitivity of the gastric mucosa. The increased sensitivity leads to inflammation of the lining of the stomach, which is called gastritis. Same things occur in hyperacidity, heartburn, GERD or indigestion, but the mechanism may be different. For example, in heartburn and GERD, acid backs up into the food pipe due to irritated esophageal sphincter. The continuous irritation of the sphincter leads to its malfunctions. This irritation occurs due to increased sharpness of the Pitta dosha, according to ayurveda. As Sutshekhar Ras acts on these things and restores the balance, so gives relief from all gastric diseases occurring due to this. Therefore, it is highly useful in hyperacidity, gastritis, GERD (gastroesophageal reflux disease), or acid reflux. It soothes the gastric mucosa, and linings of the oesophagus, and esophageal sphincter, which helps to reduce their irritation and ultimately cures these problems. Similarly, Sutshekhar Ras works to reduce the inflammation of the esophagus, as it works in gastritis. In this case, it should be used in the reduced dosage of about 65 mg along with Yashtimadhu, Shatavari, Giloy Satva, Praval Pishti and Mukta Pishti. This combination can provide relief in this condition within a few weeks. It reduces chest pain, epigastric tenderness, and pain or difficulty during occurring swallowing. It also prevents the leakage of stomach acids back into the esophagus. Sutshekhar Ras is a good remedy when loss of appetite is linked with Pitta conditions like heartburn, acid reflux, or hyperacidity as discussed above. It maintains and restores the natural balance in acid secretion and reduces gastric irritation. The second action also appears on the mind and improves the desire to eat. Many people with liver disorders also reported poor appetite. If Pitta is the main condition in other associated symptoms, then Sutshekhar Ras is useful. If condition is likely to be Kapha, then Arogyavardhini Vati is more beneficial. Sutshekhar Ras is highly effective medicine for motion sickness. If it is taken half an hour before travelling, it prevents nausea, vomiting, upset stomach, feeling of restlessness, and dizziness. In long journeys, it should be taken after every 4 to 6 hours in dosage of 250 mg for adults and 125 mg for children. Sutshekhar Ras has antispasmodic action. It also regulates the muscle functions and balances the Vata and Pitta disturbances in the abdomen including pelvic region. It reduces sharp cramps in the abdomen and pelvis that occur at the start of menstrual flow. According to ayurveda, this type of pain is linked with mainly Vata, but also associated with Pitta, so Sutshekhar Ras is drug of choice for this in ayurveda. In acute cases, Praval Pishti should also be given along with Sutshekhar Ras. In intense pain, this combination should be repeated after every 3 hours until relief. The dosage of both medicines can be increased to double if patient does not get relief within 6 hours. After acute attack, the course of treatment should be continued for at least 3 months in normal dosage, which should be given twice daily. It helps to prevent future attacks and treats the Primary Dysmenorrhea. If course of this remedy is not completed for 3 months, then many patients reported recurrence. Patients, who completes 3 months course, do not have menstrual pain after 3 months and have normal menstruation. According to ayurveda, disturbance in Vata and Pitta balance can cause aggressive types of dreams. High grade fever also causes similar symptom. However, in fever, Sutshekhar Ras Gold lowers body temperature and relaxes the mind, which gives relief from sleep talking in fever. When Somniloquy occurs in sleep disorders, its most common cause is disturbed dreams, which are due to aggravated vata and pitta. Sutshekhar Ras pacifies Vata and Pitta, which helps in inducing soothing feeling, relaxes the mind, reduces stress and ultimately gives relief from the sleep talking and results in sound sleep. All these symptoms denote the aggravated Vata and Pitta. Sutshekhar Ras provides relief in all these cases. In Pitta cases, Praval Pishti and Mukta Pishti should also be added for enhancing effects of Sutshekhar. The general dosage of Sutshekhar Ras is as follows. Sutshekhar Ras is available with gold and without gold. The dosage of both should be the same. Sutshekhar Ras Gold is more effective as compared to Sutshekhar Ras without gold. The actual formula of Sutshekhar Ras contains gold as an essential ingredient. The safety profile of Sutshekhar Ras is not evaluated on modern parameters, but it is considerably well-tolerated when processed according to ancient techniques described in ayurveda texts. The most of ingredients are detoxified before adding in it. The heavy metal content in it may be concern of modern science, but the evaluation becomes essential for naturally processed medicines before declaring anything based on raw metal’s toxicity. Similar toxicity is defined in ayurveda when metals are consumed in raw form, but the very opposite effects are mentioned for Bhasma when processed according to Bhasma making procedures. Still it is controversial subject, which requires more research. There are no short-term or acute side effects reported, but long-term use (i.e. more than 3 months) should be discouraged. Follow your doctor’s instructions and discuss in detail for possible benefits and long-term use adverse effects if he advised for more than 3 months. The toxicity with Sutshekhar Ras is yet unknown. Sutshekhar Ras is not generally recommended in pregnancy. Let your doctor decide whether it is needed or not if no alternative measure is available. Many ayurvedic doctors use it in emergency for severe nausea and vomiting occurring in pregnancy. It can be used by lactating mothers if required, but it should be used under supervision of your doctor and if it is essentially required and no other safer alternative is available. All Ras preparations including Sutshekhar Ras are contraindicated in Kidney Diseases. Drug Interactions with Sutshekhar Ras are yet unknown. I am suffering from esophagitis since last 23 years & my metabolism system is too weak, I can’t take any medicine e.g. AVIPATIKAR CHURNA also .There is constant pain in my upper abdomen. Since last 9 months 3 times bleeding occurred in the stools. Please let me know if this sootshekhar ras can be taken without doctor’s consultation? You should consult an ayurvedic doctor before using it.